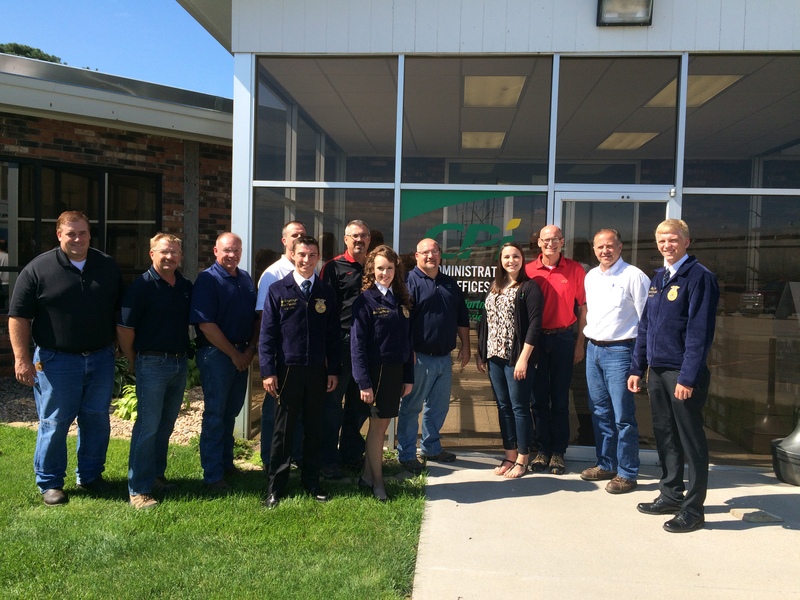 The Nebraska FFA State Officers visited CPI this summer. CPI is one of our Spotlight Sponsors for the 2015-2016 year. This year will be the first year they are partnering with the Nebraska FFA Foundation in the I Believe in the Future of Ag campaign. Ron Ziggafoos, Vice President of Corporate Affairs, said, “Nebraska FFA is an extension of our communities and our owners. We believe that by supporting Nebraska FFA we are investing in the future of agriculture.” CPI sees a benefit of being a sponsor by showing their support to many local chapters in their territory as well as assist in statewide recognition of FFA. CPI chooses to mainly support the Nebraska FFA Foundation as a corporate sponsor because they can help sponsor FFA chapters all over Nebraska. The Nebraska FFA Foundation would like to thank CPI for their generous donations to the Nebraska FFA.